It's always a good day when a stitcher can add new threads to their collection...So here we go....Option A thread kit includes some beautiul threads if you are NOT purchasing the "Faith in Today" wool kit and are choosing your own woolies for your flower garden. 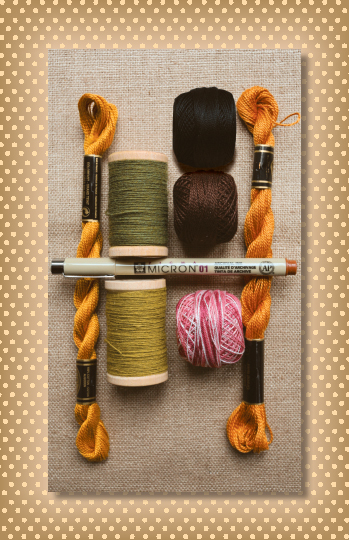 Thread kit includes 2 wooden spools of the beautiful imported Rustic Wool Moire thread, 3 lovely Valdani perle cotton balls, 1 DMC perle cotton ball, 2 DMC perle cotton skeins, and the "needful" brown pigma marker for tracing the verse lettering on your fabric. 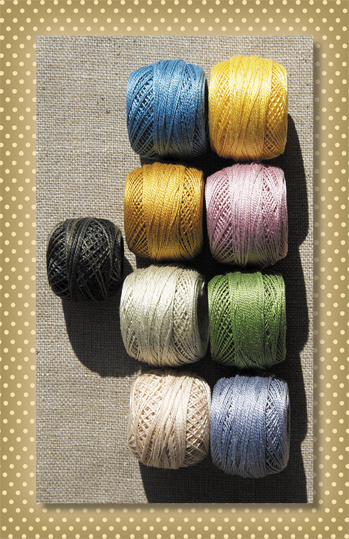 The other threads you will need are those to match your woolen pieces when stitching to the background fabric. These are not included as they may vary depending on colors of your woolie flower pieces. 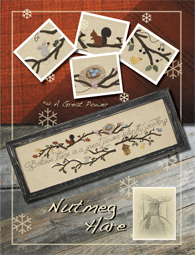 Purchase pattern separately and relax and enjoy your Nutmeg Hare stitching time. It's always a good day when a stitcher can add new threads to their collection...So here we go....For those who are purchasing the "Faith in Today" wool kit, Option B thread kit includes all the beautiful specialty threads matching the wools and used in the detail stitching. Kit includes 2 wooden spools of the beautiful imported Rustic Wool Moire thread, 6 lovely Valdani perle cotton balls, 2 DMC perle cotton balls, 2 DMC perle cotton skeins, 2 DMC embroidery floss skeins, and the "needful" brown pigma marker for tracing the verse lettering on your fabric. 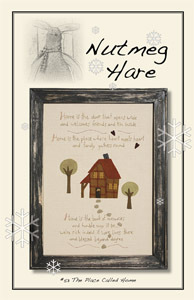 Purchase pattern and wool kit separately and relax and enjoy your Nutmeg Hare stitching time. 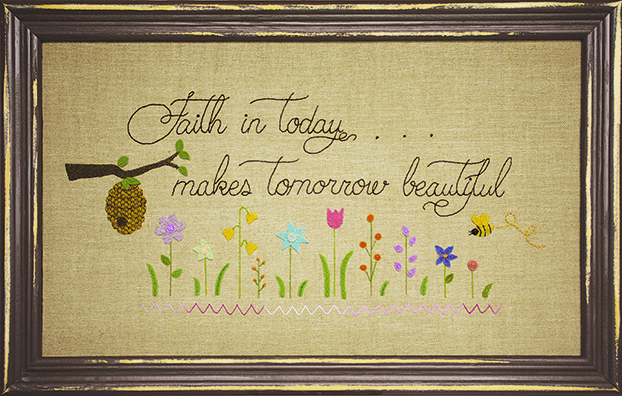 "Faith in Today...Makes Tomorrow Beautiful". An uplifting verse to remember daily with a smile. Enjoy some stitching time with Nutmeg Hare's new wool applique design. Woolies in lovely shades for a flower garden of grace and beauty will lend to relaxing time spent with wool, needle, and thread. Finished design measures 12" x 20" framed. Fabric With Wool Kit Also Available! Purchase Thread Kit (option A or option B) Separately! It's a holiday stitching adventure with"Ring Ye Bells" assortment of beautiful threads.. Let the festivities begin...Thread kit includes 3 lovely Valdani perle cotton balls, 2 gorgeous Valdani wool floss skeins, 1 DMC perle cotton skein, 2 Cosmo embroidery floss skeins, and the wonderful brown pigma "must have" marker for tracing the verse lettering on your fabric. 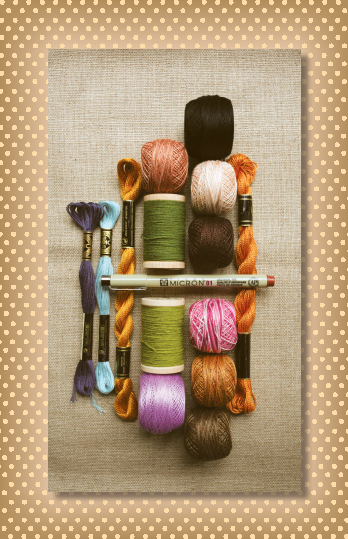 The only other threads you will need are the flosses to match your woolen pieces when stitching to the background fabric. These are not included as they may vary depending on your woolen pieces. "Ring Ye Bells" thread kit is for the specialty threads only. 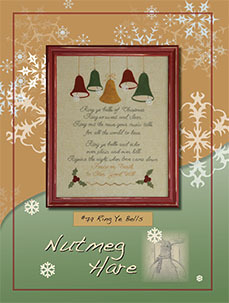 Purchase pattern separately and relax and enjoy your Nutmeg Hare stitching time. 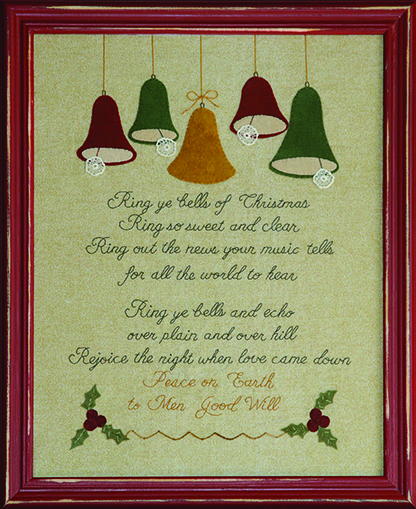 "Ring ye bells of Christmas, Ring so sweet and clear".......Nutmeg Hare invites you to gather together your embroidery hoop, thread your favorite needle, and enjoy stitching the jubilant "Ring Ye Bells" holiday verse. Combining stitchery with wool appliqué, "Ring Ye Bells" shall be a glorious holiday stitching adventure that you won't want to miss. "Rejoice the night when love came down... Peace on Earth, to Men Good Will! ! " Finished framed design measures 16 1/2" x 20 1/2" . It's thread collecting time as you embark on a wonderful stitching adventure with Emily's Hope. 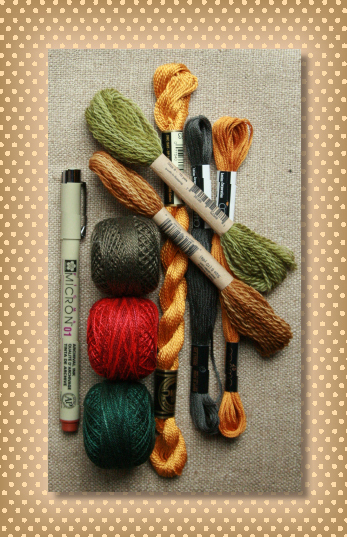 A treat indeed, "Emily's Hope thread kit includes 2 lovely Valdani perle cotton balls, 3 DMC perle cotton balls, 1 DMC perle cotton skein, 1 DMC embroidery floss skein, and the wonderful brown pigma "must have" marker for tracing the verse lettering on your fabric. "Emily's Hope thread kit is for the specialty threads only. 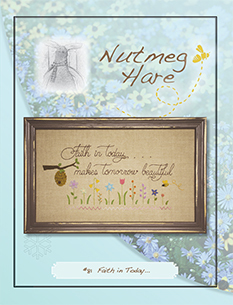 Purchase pattern separately and relax and enjoy your Nutmeg Hare stitching time. 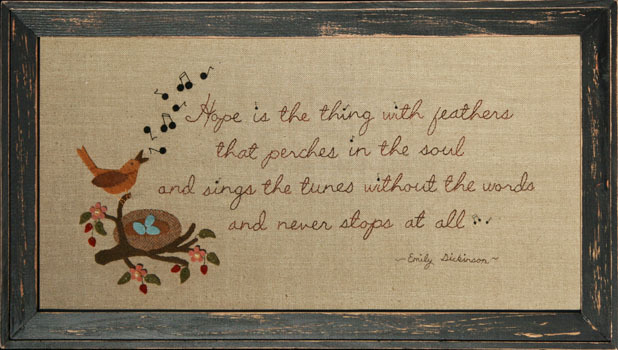 'Tis the Bird of Hope as Emily Dickinson writes "Hope is the thing with feathers that perches in the soul... and sings the tunes without the words..." Enjoy some Nutmeg Hare stitching fun with "Emily's Hope". Hand dyed wool in gorgeous shades will lend to the enjoyment of stitching this inspirational piece. Finished design measures 11 1/2" x 22 1/2" framed. 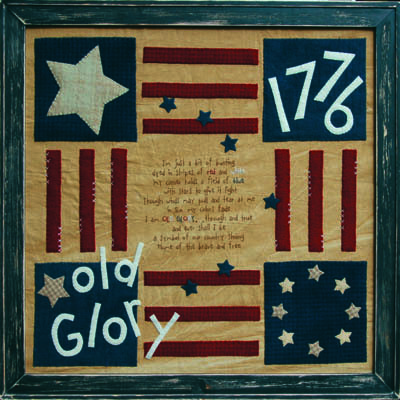 with stars to give it light...."
Next add "Old Glory"woolen accent pieces and watch your Americana treasure evolve as you continue on with needle and thread. 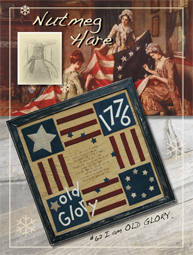 Enjoy this patriotic piece all through the year after framing "I am OLD GLORY" in a lovely primitive style frame. Finished design measures 21" x 21" framed. 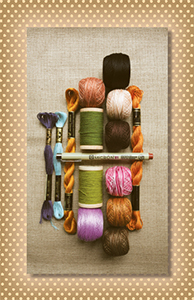 Treat yourself to this stitcher's paradise of threads. Complete "A Great Power" and still have plenty of threads to add to your endless thread collection. "A Great Power" thread kit includes a wonderful assortment of colors beginning with 2 lovely Valdani perle cotton balls, 7 DMC perle cotton balls in "must have"shades for the stash, and 3 DMC embroidery floss skeins. And as an added plus, the brown pigma .01 marker is included with the kit and is ideal for tracing the lettering onto the foundation fabric. 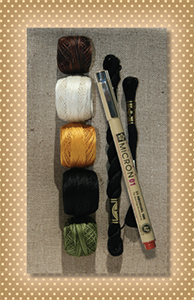 The only other threads you will need are the flosses to match your woolen pieces when stitching to the background piece. These are not included as they would vary depending on your woolen selection. "A Great Power" thread kit is for the specialty threads only. Purchase pattern separately and relax and enjoy some Nutmeg Hare stitching time. The daily miracles around us... The miracles of nature...The wonders of the seasons ...It is "A Great Power", and it is" Silently Working". 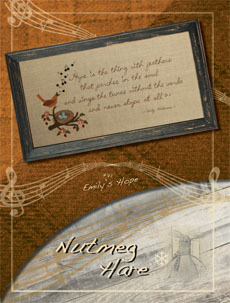 "Believe" and enjoy stitching a powerful verse with Nutmeg Hare's new wool applique stitchery. Hand dyed wools in gorgeous shades for each of the seasons will lend to the enjoyment of stitching this inspirational and fun piece. Finished design measures 9 1/2" x 31" framed. Treat yourself to some "stitcher's candy" with this lovely collection of threads for the "Candy Trail" wool applique mat. 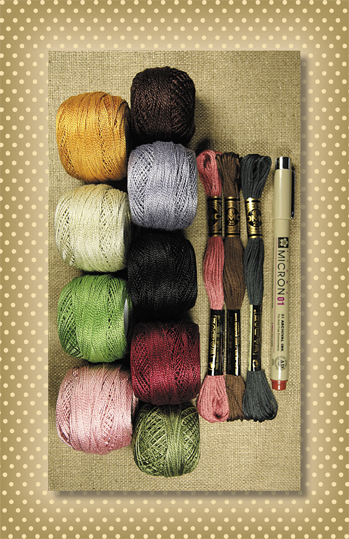 Thread kit includes a beautiful assortment of colors with 2 Valdani perle cotton balls, plus 7 DMC perle cotton balls in "must have" shades for the stash. The only other threads you will need for the wool applique mat are the flosses to match your woolen pieces when stitching to the background wool. These are not included as they would vary depending on your woolen selection. Please note that the "Candy Trail" thread kit does not include the flosses for the Candy Trail stitchery. These may be purchased as as a kit (find option listed under "Candy Trail" pattern). "Candy Trail" thread kit is for the specialty threads only. Purchase pattern separately and relax and enjoy some Nutmeg Hare stitching time. 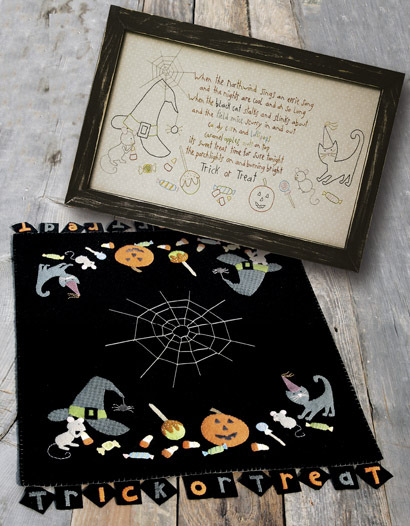 It seems with the way time flies that one can easily say that "Fall" is just around the corner...In that case, it is never too early to begin your "Trick or Treat" wool stitching fun. Candy corn and lollipops, caramel apples, witches hat, and a delightful cat and mouse rivalry are the theme to this Halloween table topper. 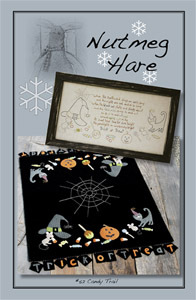 ...And once again as in Nutmeg Hare's " North Pole Workshop" design, this pattern comeswith an added goodie,.... "Candy Trail" stitchery pattern is included with the wool applique design..You will love the wonderful autumn verse and definitely want to make both. Finished wool mat measures 20" x 26". Finished stitchery measures 10" x 18" framed. 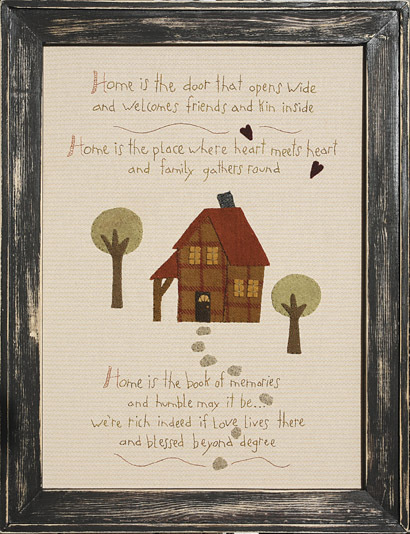 display it in the entryway where it can be treasured for years to come. Finished design measures 11 1/2" x 16" framed. In celebration of the 10 yr. anniversary of Carriage Country Quilts, a wonderful top 10 quilt store which is situated in the midst of Des Moines, WA, in none other than "a yellow house", this stitchery was designed as a gift for my friend Debbie to remember the day. 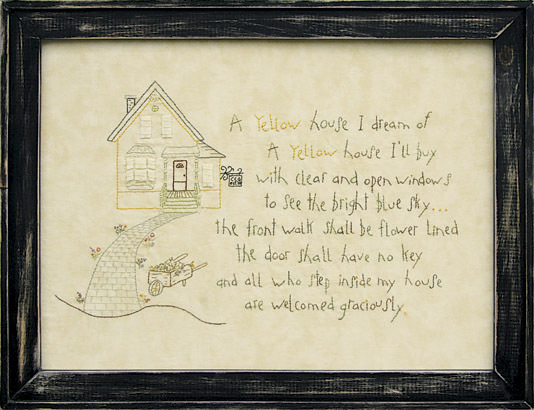 Have fun using wool for the windows, and personalize the wrought iron house sign with initials and year of establishment to make it your own....or stitch "A Yellow House" as a special gift for friends or family. Finished design measures 16 1/2" x 12" framed. Our charming wool table runner is a flower lovers "must make" design, and combined with a "twin" stitchery makes it even better...Perfect for those sunny days we wish and wait for. "Garden Fancies" finished table runner measures 31" x 9 1/2". Finished stitchery measures 6 1/2" x 6 3/4" framed. A" carefree spirit" theme...this enjoyable project combines both stitching and woolen leaves drifting through the air. So precious and sweet....finished design measures 12” x 14" framed. A wonderful stitchery... both peaceful and soothing and enjoyable to stitch and finish for the Winter months. And I think we can all agree that "Love is a Little Church"... yes indeed! 13 1/2” x 15 1/2" framed. God's "gift of all eternity". measures 13 1/2" x 15" framed. comes to life with the wonderous excitementof children playing. Finished design measures 10" x 12" framed. This fairy tale stitchery is reminiscent of the "Cinderella" story girls wish for ... and more. Finished design measures 9 1/2” x11” framed. and the ideal sentiment to live by in life. Finished design measures 9 1/2" x 14 1/2" framed. hang in your home entryway. Enjoy it for years to come! measures 13" x 11" framed. These stars are the candles of heaven. measures 13" x 15" framed. These are truly our "eternal blessings". measures 13" x 18" framed. Dear Mom....This stitchery is just for you! Finished design measures 12 1/2" x 6" framed. Bringing joy to others ... "Life's Little Flower" is just about that. A stitchery you will want to add to your collection. Finished design measures 11 1/4" x 8 1/2" framed. The dear little girl being described in this precious stitchery just so happens to be that special little girl you love...they are one in the same! Finished design measures 13 1/2 x 9" framed. A little boy....his boat....and God to guide him. A stitchery to make and cherish. Finished design measures 10 1/4" x 11 1/2" framed. Finished design measures 11 1/2" x 9 1/2" framed. "Yes, the moon really does see you." Our little ones are quite impressionable. Finished design measures 11" x 9 1/2" framed. "Luv Garden" as in this sweet stitchery. Finished design measures 10" x 10" framed. and this stitchery reflects just that. A stitchery ideal for your free spirited and carefree little girl. Finished design measures 11 1/2" x 9" framed. Finished design measures 12" x 9 1/2" framed. Unconditional love is the true meaning of this stitchery. Finished design measures 12" x 8 1/2" framed. This stitchery is reminiscent of childhood days! Finished design measures 12"x 8" framed. Stitch this bedtime prayer for the wee ones to recite each night. How sweet this is! Finished design measures 12” x 9” framed. A special design...This endearing stitchery is all about the love we have for our little ones. Finished design measures 12” x 11 1/2” framed. Sugar and spice and everything nice...a precious stitchery for any girls room. Finished design measures 12 x 9 framed. this stitchery is a favorite to make. 12 1/2 x 9 framed. Finished design measures 13 1/2 x 6 1/2 framed. Also makes a wonderful pillow for a child's room!